If you read last month's review of the 2007 Series 1 Madballs, you know that we at Scary-Crayon have been fans of these freaky funsters since they were unleashed on the world back in 1986. If you've been reading the site for longer than that -- or followed our links in that last piece! -- you know that we've also reviewed the Madballs' direct-to-video "Escape from Orb!" cartoon and coffee table jokebook entitled "The Madballs History of the World". And if you read those pieces, you might've seen us mention that we own a whole bunch of other Madballs merchandise -- namely another cartoon, several more jokebooks, and a handful of comics -- that will doubtless appear on SC sooner or later. 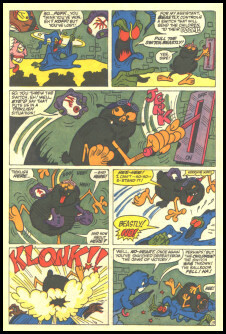 Today, we present the holy grail of the aforementioned comics, which incidentally isn't even a Madballs book. 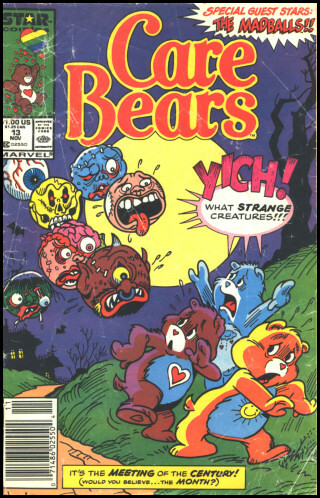 No, the honor of being perhaps the oddest piece of Madballs literature ever produced actually goes to Star Comics' Care Bears Volume 1, #13... in which the titular bears of caring and sharing meet those repulsive balls of flying grossness. If you thought Archie and the TMNT was an unlikely matchup, you ain't seen nothin' yet. 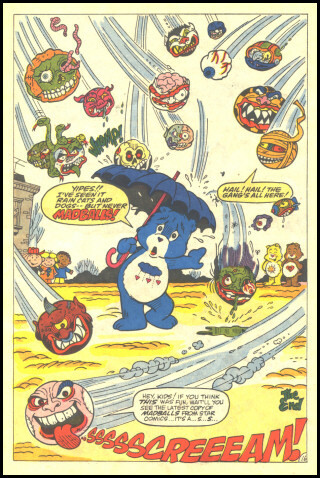 In truth, though, the Care Bears and Madballs (at least as the 'balls appeared in the comics) had quite a bit in common. Magical talking bears that shoot mind-altering rays of love from their bellies are arguably as strange as the drooling products of toxic waste, weather-beaten sports balls, and random household objects and/or small animals, and both groups spent the majority of their time playing with 8-year-old children. 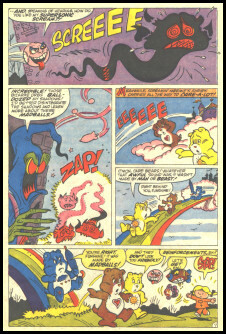 The Care Bears and Madballs also routinely performed impressive acts of heroism, whether their efforts entailed freeing kids from the influence of evil shadow demons or battling wicked weatherwomen intent on making it rain all day, every day. 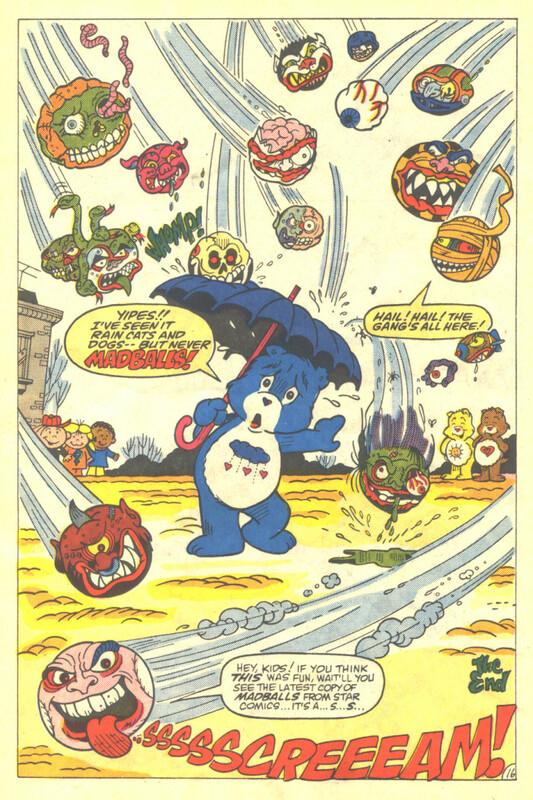 Sure, their methods were different -- whereas the cuddly Care Bears would mostly transform their enemies into their allies with concentrated blasts of therapeutic warmth, the Madballs would just make awful puns, scream, and break stuff until the criminals willingly surrendered to the police -- but their broader goals and hobbies were very similar indeed. 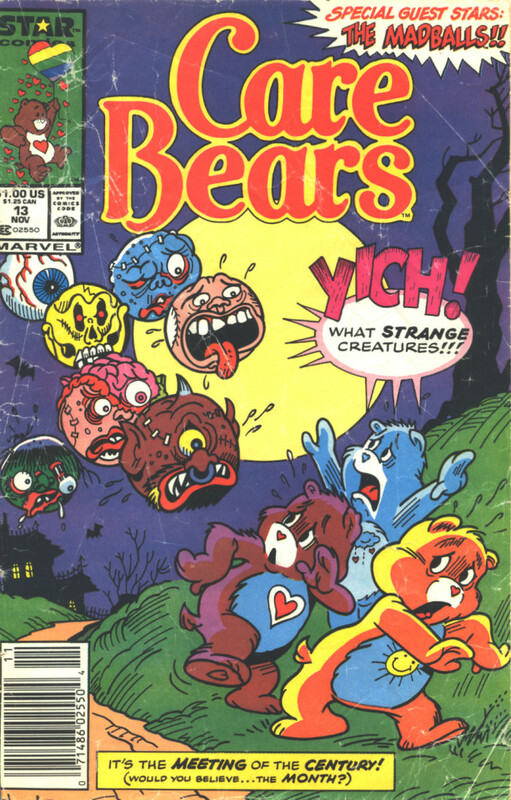 So despite the image on the cover, which depicts the Madballs and Care Bears freaking out upon meeting each other, they actually hit it off pretty well -- and now, since we've scanned the entire issue for your benefit (hope that's okay, Marvel; it's been over 20 years since this issue was released in November 1987!) , you can view this epic crossover for yourself! Since you likely won't be able to make out the text in the smaller images displayed on the page, each of the images links to a larger scan that's hopefully easier to read. In keeping with SC tradition, I'll also provide a summary of the events while commenting and cracking the occasional joke. Perhaps moreso than the heroes of any other decade, the cartoon stars of the 1980s were depicted in such a way that kids could easily identify with and/or relate to them. Even if they were otherworldly alien creatures, snot-nosed freaky things with no established backstory, or well-muscled masters of the universe from another dimension, sooner or later they found themselves hanging out with children in a forced attempt to bring them closer to the hearts of their target audience. 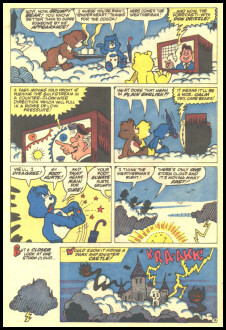 In this respect, the Care Bears probably had it easier than most franchises of the day: for all of the maturity that True Heart Bear, Noble Heart Horse, and several other leader-esque members of the Care Bear family exhibited at one time or another, the Care Bears mostly behaved exactly like energetic yet well-behaved children. 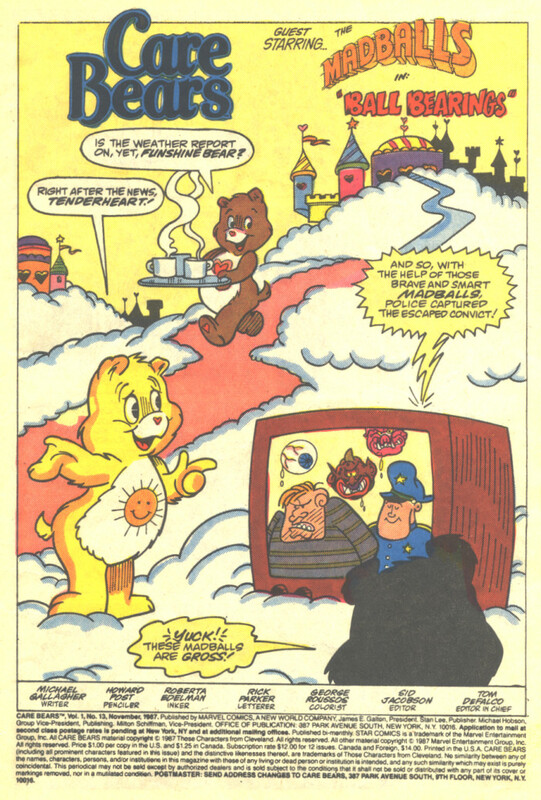 Which is why, despite essentially living in Heaven and having the ability to look down on anything in the entire world, we find Funshine Bear, Tenderheart Bear, and Grumpy Bear watching television. They are, however, watching the news, which is a far cry from the cartoons that most kids (and I) would be watching. I'm not too sure about why they're so eager to see the weather report, though -- I mean, I'm no meteorologist, but I don't imagine that folks who live in a magical realm on top of the clouds would get the same weather that we do down on the surface of the planet. 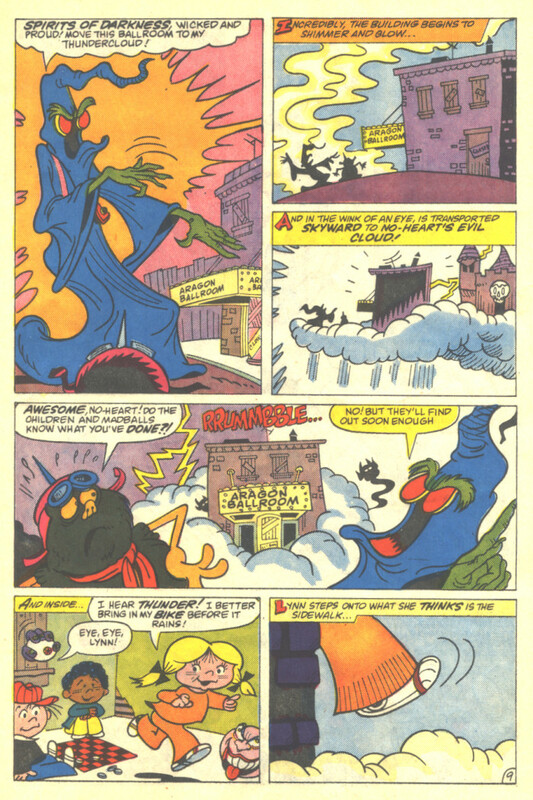 ...especially when that grey cloud is revealed to be the floating home of the evil No-Heart and his bumbling henchman, Beastly! 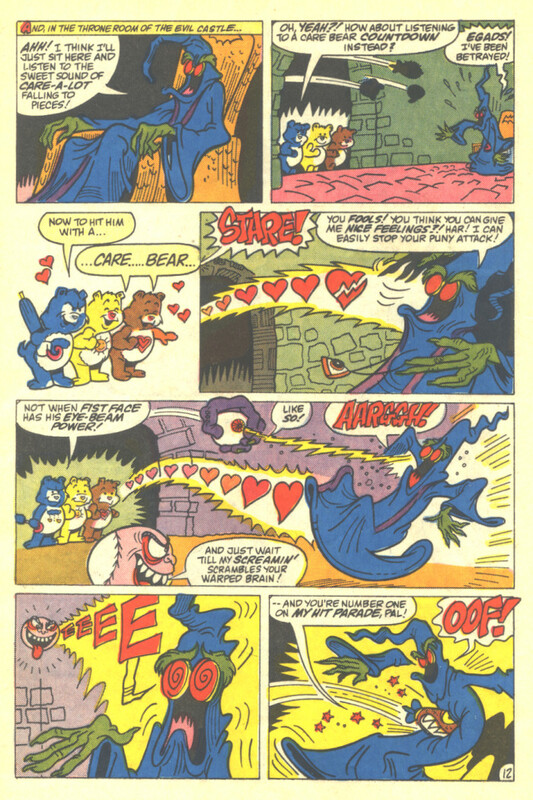 Beastly gives us a spot of physical comedy, No-Heart announces his plans to Destroy the Care Bears Once and For All -- pretty routine stuff, really. But hey, did anyone else notice that No-Heart is a demon overlord? This is one thing that's always baffled me about the Care Bears. They've got to be among the wussiest heroes ever, and yet their primary enemies are straight out of the Batman rogues gallery: they're either mad scientists with freezing powers or immortal demons with shapeshifting powers and/or unlimited armies of shadow warriors. And even Batman didn't take on demons on a regular basis. There is no way the Care Bears should be winning these battles. 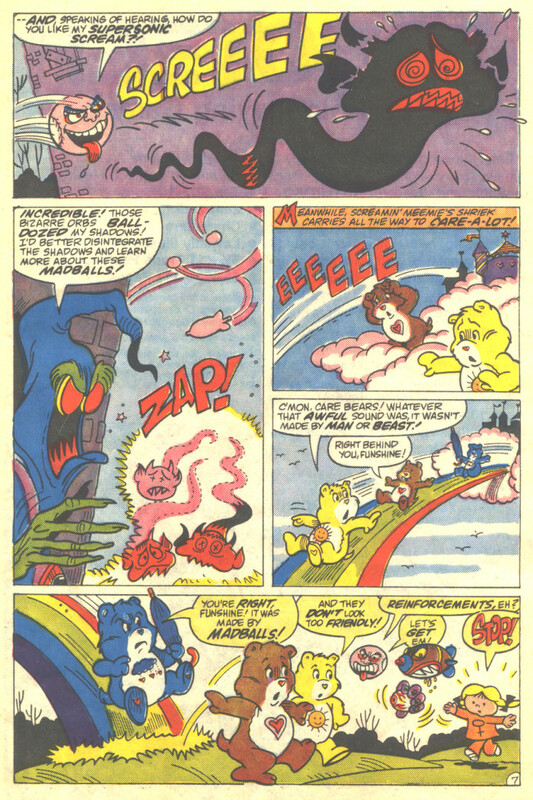 Like many children's cartoon heroes, when the Care Bears emerge victorious, it's not because of their own skill and valor, but rather because Hell's educational system is flipping terrible. On that note, let's see what No-Heart's got up his sleeve today. Actually, as it turns out, this seems like a pretty good plan -- at first. Apparently we're a little late to the party, as No-Heart has already carried out the bulk of his evil scheme by creating diversions all over the globe. 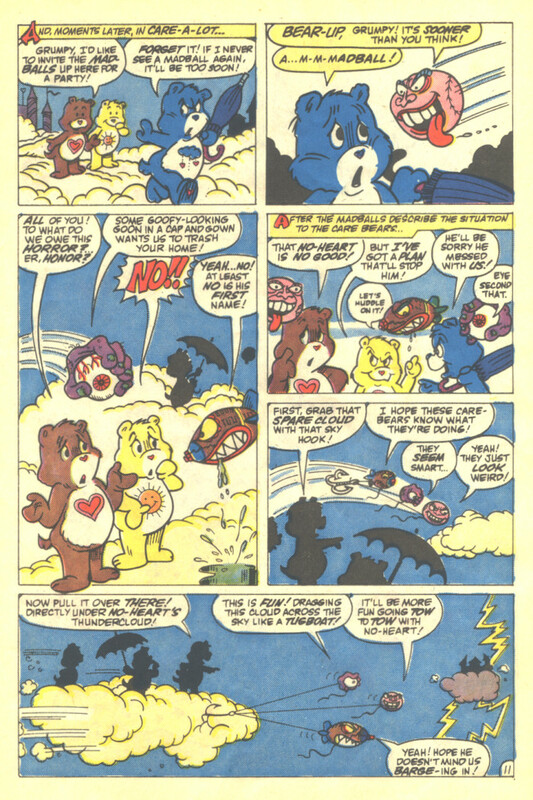 So that's why we only met three Care Bears in the opening pages: they're the only ones not busy elsewhere! And with the majority of the bears off on their own separate missions, No-Heart is ready to storm Care-A-Lot and take over the joint. It sounds great until he decides that the best way to bring his plan to fruition is to attack three random kids standing outside a ballroom... which makes absolutely no sense at all. Yeah, he claims that he wants to lure the bears out and leave Care-A-Lot completely unprotected, but he's already established that he can totally take just three -- and if he can defeat them on their own turf, what's the point of getting them to come out and play? This, friends, is why the Care Bears always win. No-Heart is an idiot. No-Heart's also incredibly unlucky. 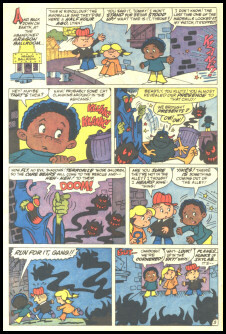 Out of all of the children in the world that he could possibly have chosen, these three just happen to be friends with the Madballs -- and just as No-Heart's shadow demons attack, Touchdown Terror, Screamin' Meemie, and Fist Face arrive to pummel the evil shades while punning horribly to add insult to injury. And if you didn't believe me about the puns, see for yourself: practically everything the Madballs say is some kind of pun. Fist Face even puns about the fact that they pun so goddamned much, saying, "Let's dispense our unique brand of pun-ish-ment!" 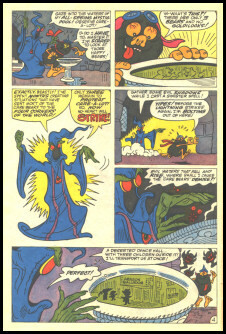 And just to make sure that you don't miss the puns, the effect is even driven home by the excessive use of boldface in the Madballs' dialogue bubbles. 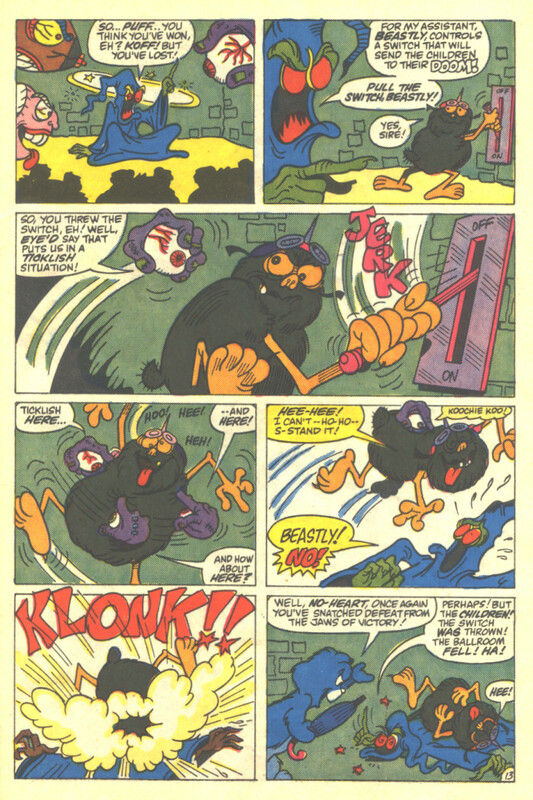 Still, considering that I was six years old when I was reading these comics, I'm pretty sure I didn't get most of the puns despite the emphasis. I probably didn't even know what the word "pun" meant. 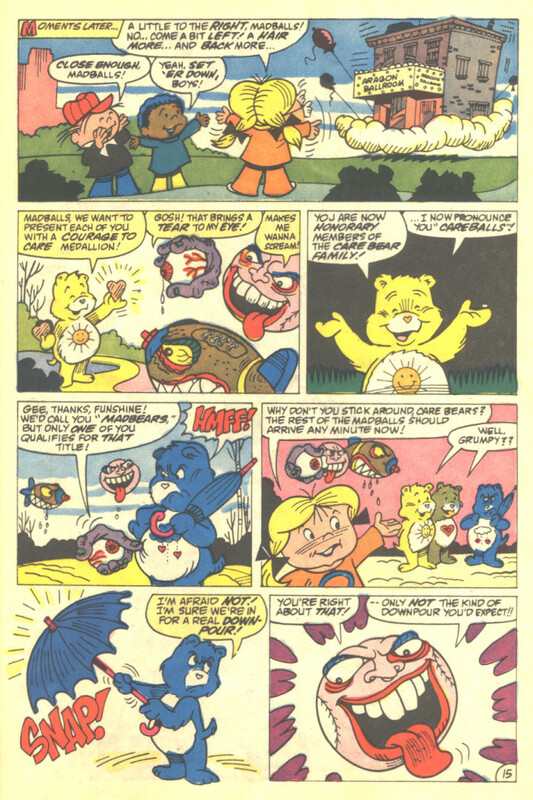 As you see, the Madballs even have No-Heart punning, but what's more important is that, given that Screamin' Meemie's shrieks prompt the Care Bears to investigate, these pages contain the actual first meeting between the bears and 'balls. 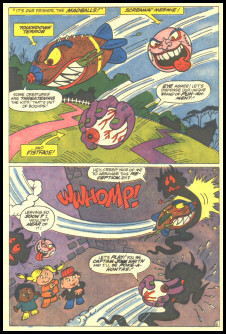 There is admittedly a little animosity at first: the Madballs mistake them for baddies and want to jump them. But unlike the meeting of the Power Rangers and Teenage Mutant Ninja Turtles, where they were more/less at odds for most of the episode, the confusion here is sorted out within a single panel. Here's where things get even dumber on No-Heart's end, though. 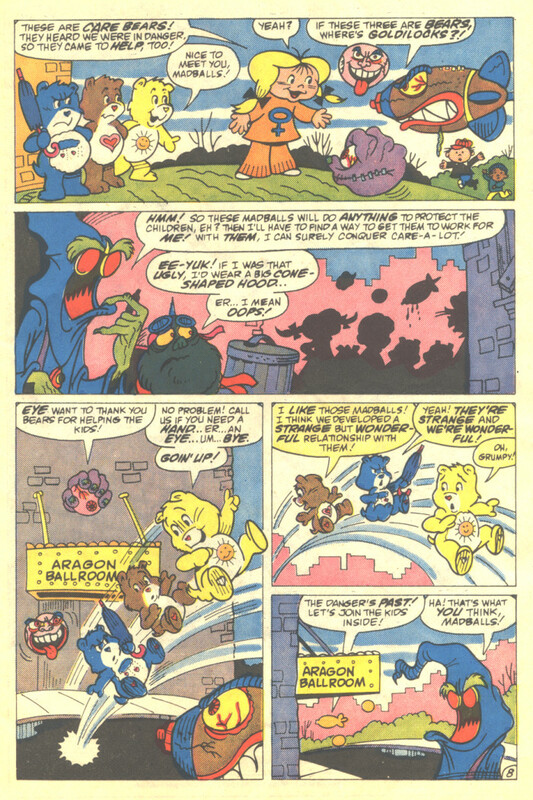 He'd already established that his forces could take three Care Bears, but he created the diversion in the first place to lure the Care Bears away from Care-A-Lot so that he could attack without incident... and even though the Madballs totally "ball-dozed" his shadows, the distraction worked. The Care Bears heard the commotion and came down. Therefore, at this very moment, NOBODY IS GUARDING CARE-A-LOT. But what does No-Heart do? 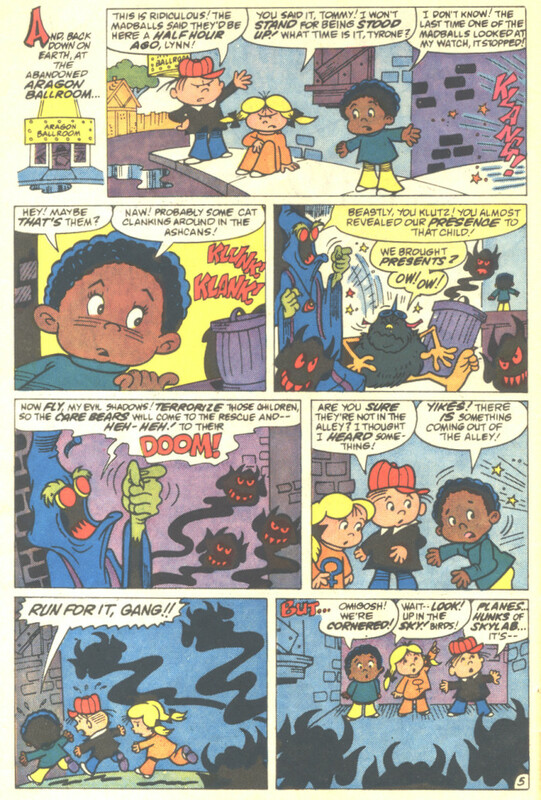 Rather than following his own goddamned plan, he notices that the Madballs are willing to do anything for the children and begins working on a way to get them on his side. I have no idea why -- it's completely pointless and unnecessary. Dude theoretically has an entire army of shadow demons at his disposal. It's not even like the Shredder and the Foot Soldiers from the old 'toon -- they at least required materials and technology to make. But No-Heart's shadow demons? Stick your hand in front of a light and look in the opposite direction. That's how easy it is to make shadows. Yet for some reason he now wants to bring down the Care Bears with three drooling balls. I mean, it makes sense that a villain would want to pit heroes against each other rather than doing everything himself -- it would make victory sweeter, and regardless of the outcome there would be a little less good in the world -- but No-Heart doesn't say anything to that effect. He's just stupid. 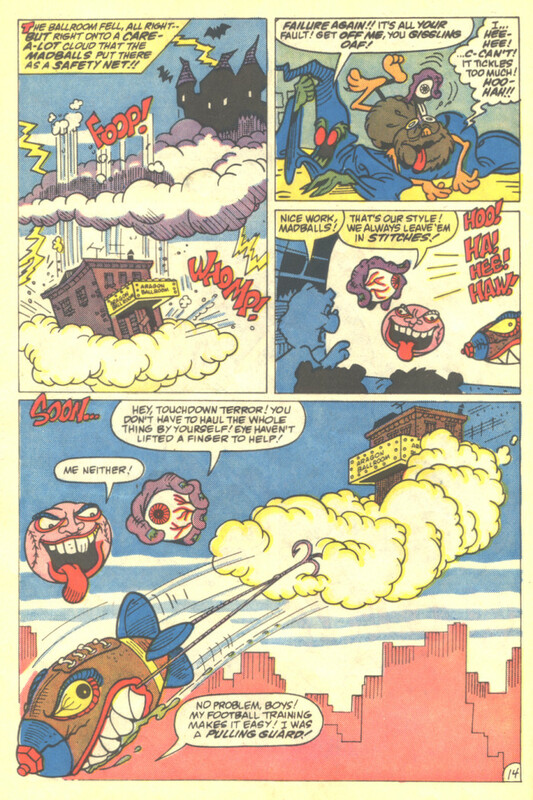 So to win the Madballs to his side, No-Heart relocates the abandoned building where the kids hang out to the top of his thundercloud and threatens to send it crashing to the earth -- with the kids inside, naturally -- if the Madballs don't destroy Care-A-Lot. This new plan is still completely unnecessary, but at least it works in theory... assuming that the Madballs don't just go to the Care Bears and tell them exactly what's happened. Which is, of course, precisely what they do. As a result, the Madballs don't return with the heads of the Care Bears in tow. They return with reinforcements. Good job, No-Heart. 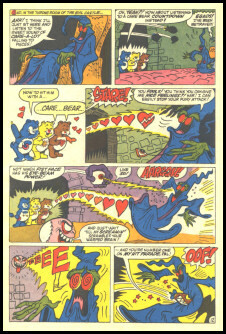 So while the Care Bears themselves would normally be outclassed by No-Heart -- just as the Judge's evil burning power failed to affect Angelus because he is a creature of pure evil, the patented Care Bear Stare can't induce lovin' feelings in the heart of a demon overlord -- the Madballs have no trouble slamming into him and screaming until he goes down for the count. It's also worth noting that Fist Face apparently has the power to shoot beams from his eyes. 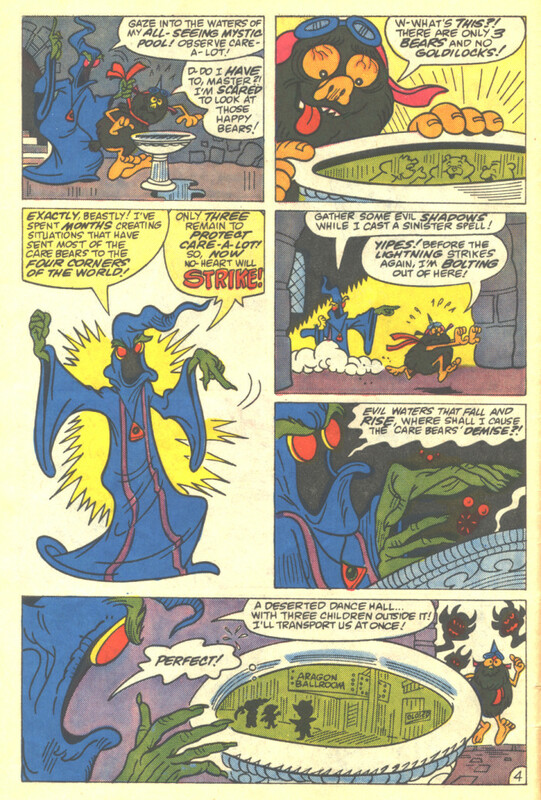 I can't remember whether he ever used that in any of the other comics, but it wasn't uncommon for Madballs to exhibit random one-time special powers depending upon the situation. 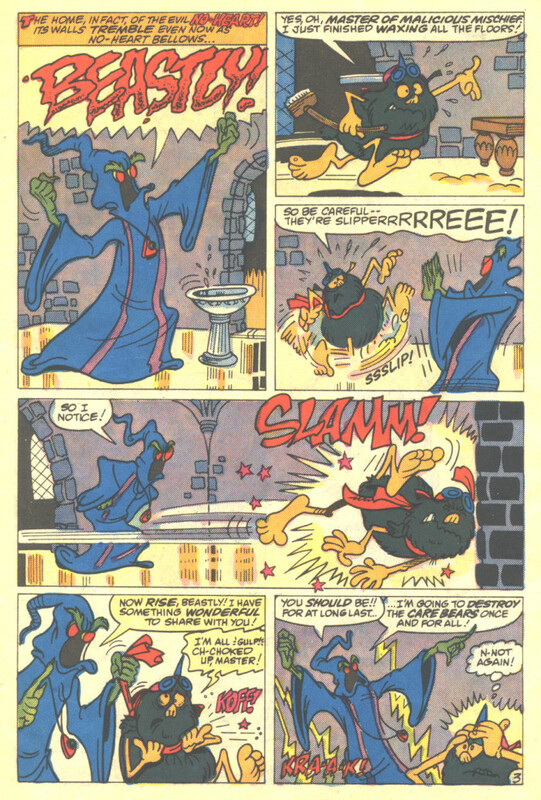 In keeping with his name, though, Screamin' Meemie was pretty consistent with his trademark attack. Page 13 contains what is easily the worst example of desperation on the part of a villain that I have ever seen. After getting his clock royally cleaned, No-Heart announces that the heroes have still lost and commands Beastly to pull the lever to drop the ballroom, thus sending the children to their doom. After he does so, Fist Face tickles him so violently that he slams into No-Heart hard -- it really isn't this demon overlord's best day. But even as red stars leap from his battered noggin, he again points out that the heroes have lost because he killed the children. You know how a joke isn't considered to be funny if you have to explain the punchline? Well, an evil plan isn't evil enough if you feel compelled to remind your enemies just why it's so evil. And if you have to remind your enemies that you've just killed their friends because they had no negative reaction whatsoever the first time, they either ignored your plan because they've already thwarted it or because they don't give a crap about the lives of the innocents. Either way, you totally lose. But in this case, the Madballs and Care Bears weren't devastated by the news of the falling ballroom because -- predictably -- they had already placed a safety cloud below it. 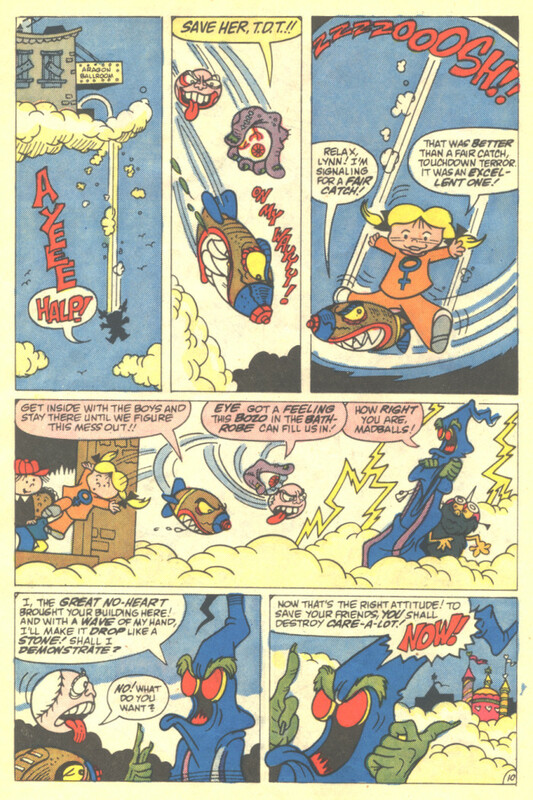 Granted, the fall still looks like it might've been enough to cause significant damage to the building and/or the people inside, but nobody ever gets seriously injured in a Care Bears comic. 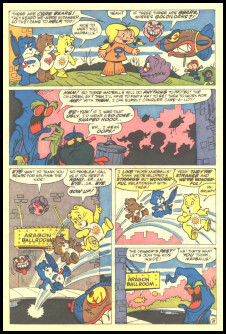 Touchdown Terror tows the ballroom back to its appropriate place on the surface of the planet, more horrible puns follow, and the Madballs and Care Bears congratulate themselves on a job well done. The Care Bears even present the Madballs with Courage to Care medallions and dub them Careballs. And in keeping with their characteristic rude and obnoxious attitude, the Madballs can't even turn off the sarcasm and punning to graciously accept the honor. I'm inclined to say that I don't know how the children put up with them, but then again I've been willing to put up with attractive women on a semi-regular basis despite finding them to be irritating as all Hell. Heck, they didn't even defy the laws of nature. So yeah, I guess having floating mutant ball thingies as friends would be pretty bragworthy even if they did happen to be the most annoying creatures on the planet. 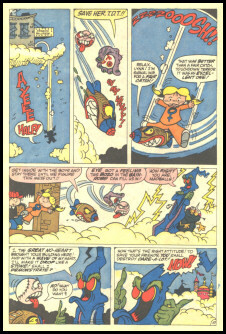 Final thoughts: this is pretty standard stuff as far as crossovers go, but these kinds of matchups hardly ever feature great storytelling -- they're simply contrived pieces that unite two sets of unlikely characters for the sake of adding a historical footnote to their adventures, bringing a shared smile to the fans of both groups, and perhaps selling more toys to kids who want to create their own crossover events at home. 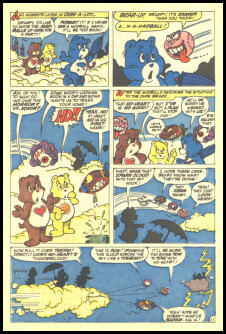 In these respects, the Care Bears/Madballs crossover was undoubtedly a success -- I not only found the book enjoyable and memorable enough to dig it up and write an article about it over 20 years later, but also made sure that my Lotsa Heart Elephant figure frequently accompanied the head popping Madballs on their sundry adventures. 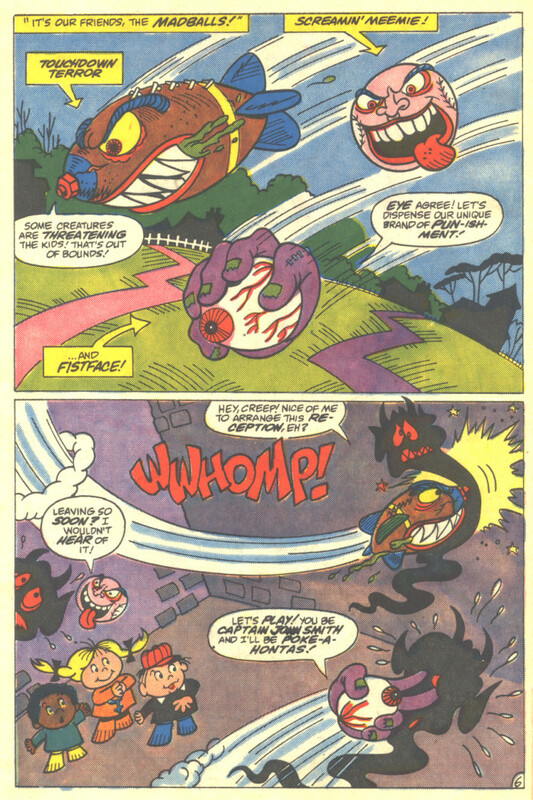 Sure, the cover of the issue is a bit misleading for featuring seven of the original eight Madballs when only Screamin' Meemie takes part in the action, but that's forgivable considering that Screamin' is pretty much the flagship 'ball and that Touchdown Terror and Fist Face are good representatives of the Super Madballs and Series 2 rosters. Besides, more Madballs would've meant more godawful puns -- and with only three of them, they've managed to average over two puns per page. I hate to say it, but perhaps, in this and only in this case, fewer Madballs is a blessing. But do I still love them? As Fist Face would say, "Eye-sore do!"